Its been way too long since i posted here, so here’s a quick one to let you know that i am still working on this! Things are a little more stable at the moment, and while the weather is getting really hot, i’m putting aside a few other (outside) jobs and im going to spend more time working on this. So hopefully i will have more frequent updates leading up to Christmas. At the end of Feb i’m off on a holiday for a week to an island called Langkawi. Its off the West coast of Malaysia and is really beautiful. This will be my first international holiday, so im quite excited about it, and the holiday will also be a bit of a celebration for my girlfriends 30th birthday. While im there, i plan to not only take lots of photos of the surroundings, but im going to take as many high res photos of leaves, plants, trees, and the landscape, to hopefully use as textures for this project. I recently sold my Samsung Galaxy S2 and bought the new Nexus 4 (only cost me $35 in the end), so ill be getting some cool PhotoSphere 360’s as well. I dont know how many of you have been keeping up with Crysis 3 and Far Cry 3, but these games are looking really good and I can’t wait to play them. Crysis 3 in particular, because if they have sorted the terrain issues and allow maps as large as i need, i will most likely be porting the project over to the Crysis 3 SDK. Anyway, for this little update i just have a shot of the Raptor Canyon that’s in the third level of Trespaser, Industrial Jungle. I also have a comparison shot of the same area as it looked in the original game. I tried to place a few Korean soldiers around to give a sense of scale, but because im unable to adjust the draw distance of these entities, they were actually out of visible range. The helicopter should give you a good indication of the size of this valley though, but take notice that its a much larger helicopter than what the original game had and is just a placeholder. 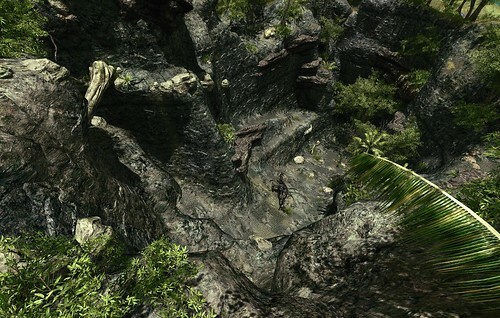 Looking around you can see a lot of ledges and little areas that you might be able to get to. There are a lot of places you can climb to if you have the skill and patience to try, and you will most likely be rewarded with some items or a special object. The punishment for falling will be either a serious injury or death, but if you do manage to survive, you will need to climb all the way back up again, which could involve a lengthy walk back up to the top. I’m the kind of gamer that tries to get into hard to reach places, and i hate not being able to get to an area i can see. So i’m designing these areas to be as explorable as possible, and provide additional replay value for when you return to them later. The top middle shows the new area that overlooks this canyon. From that position, you can look over to the other side, where there will be a slight misty waterfall, and an obscured view into the JP3 aviary area. This aviary area will be filled with cloud and mist, but you will be able to see some of the cage frame protruding through the clouds. There will also be a little bit of mist in this canyon too, which is what provides the moisture for all the moss and other vegetation. I wanted a bit more detail in my version of the canyon. I want to try to give it the appearance of plants growing on the walls, with water trickling through cracks with moss around the wet areas, and lots of debris thats fallen in over the years. I want it to look dangerous, with high walls and lots of hard sharp rock everywhere, but also give it a touch of beauty as well. It will be great to walk in here and see the raptors notice you and start circling you below, and to hear the sounds change to include a big open echo. The texture work will improve over time (i have limitations to adhere to), and more vegetation and decorative objects will be added that will spice things up a bit. Dont forget the dino’s too. The harsh mid day light makes things look very bland anyway, as all shadows are cast straight down and do little to add any additional detail. I’m in no way finished with this area, i just thought i would show it off for this post because its what im currently working on. Anyway, that’s it for now, i need to go to bed, but ill hopefully have another post soon! ~ by newoldmate on 28/11/2012. I’ve played far cry 3 for a while and I must say it’s much better than crysis 2. Engine and code run much smoother. I saw a trailer yesterday, showing far cry amazing (very easy usage) island editor. You might check it out. Make sure you go island hopping! Thrilling. And try to visit the cable car. At the top is Telugah Tujuh, a series of waterfalls, which at sunset is sickeningly romantic. Ah, sigh… I loved Langkawi! We will try to plan a few activities before we arrive, so we aren’t wasting time trying to figure out what to do. The cable car and bridge are a definite and we already have plans to hire some jet skis and do a few walks and tours. There is a jet ski tour, but its pretty expensive and I think we will just stick to hiring from the resort. Being the bargain hunter that she is, my mum has been on my back about the duty free shopping. I’m sure she thinks its this magical place where you can get your body leafed in gold for only $3 🙂 She’s been wanting to know if I can buy her a Galaxy Note Tab while I’m there..
Just out of curiosity, what resort/ hotel did you stay at and what are the shops like as far as range of products. Hope I’m not too late! I stayed at Malibest, on Pantai Cenang. The place is styled as a resort but it’s really just a charming collection of huts and tree houses right on the beach. It’s not all-inclusive by any means but it’s a nice bit of luxury if you’re a solo backpacker. The tours are fantastic. You might notice different places vary widely in price. The low-cost options (~ RM100) don’t usually cover as much. For instance, I snorkelled at Pulau Payar el-cheapo but didn’t realise I’d miss out on the glass-bottom boat and buffet lunch. Still had an amazing time though. Duty free? Still expensive to ship stock in though! I thought it was cheaper in KL, but I might’ve been looking in the wrong places. As far as stock, I didn’t venture much past the basics in the minimarts, but there’s still plenty. It’s not exactly supermarket range but that might just be Pantai Cenang – better pickings might be found in Kuah town. Anyways, I hope you have a lovely time! Looks great. I’ll have some fun jumping around there. Is there a plan for there to be any one-way entrances to accidentally get down? Like, say, I was walking along the edge and ( because I wasn’t paying attention) I walked onto a slope and slide the way down, but can’t get back up because of how steep it is. It could work as a “oh sh*t” moment as you slide right into the dangerzone. How much of a hassle would it be to port over to the new engine if needed? 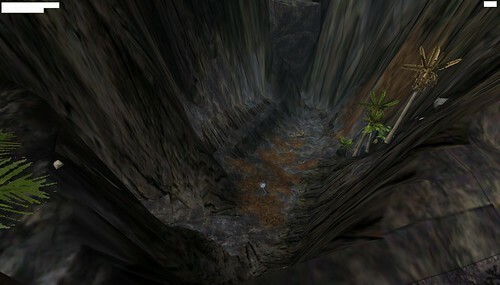 Its the same as it was in the original level, so there really is no easy way to avoid this area. You have to slide off the ledge into the canyon, and then make your way through to where the tree crossing is at the top of the other end. It will be one of the more dangerous areas of the island. I think players will dread walking through it just as much as in the original game. It is a very beautiful area though, so at the same time I think players will want to explore it and not just run through as fast as possible. The switch to Crysis 3’s SDK will be a bit tricky, but it should hopefully be more of an annoying task then an overly difficult or time consuming one. CE3 has always been more stable on my system, with better memory management. I used it to sculpt the island height map before importing it into CE2. I don’t think it ever crashed and had it not been for the terrain issue, I would have used the Crysis 2 SDK to begin with. CE3 is much more likely to receive support for the Oculus Rift then CE2, as well updates in general. It all comes down to the terrain though and if the engine can support a map this large. I’m not worrying about it, because I’m happy to stick with CE2 if its not up to the task. I am a new follower and wish you all the best with this. Hi, I’m new to here. I used to play Trespasser with my dad back in 1998 (Yes, he was one of the few that actually bought the game, for some reason), and although it was really broken, we still had a lot of fun playing it. My computer isn’t powerful enough to play your updated version but I wanted to let you know that I am so happy to see that you’re doing this. Hopefully by the time it’s completed I’ll have a better computer and will be able to play it. Thank you so much for doing this. I always wanted to play a good version of Trespasser, and you seem to be on the right track. Seriously, don’t give up on it. You’re awesome! Thanks! Dont worry, i wont be giving up!